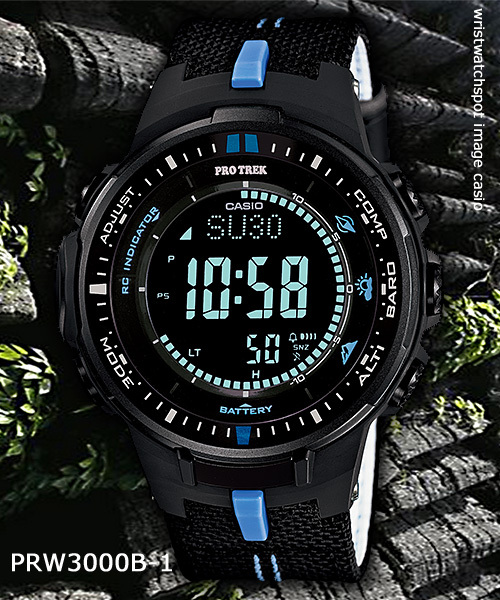 Insomuch as it is a premium watch, in the Black Titan Limited series, at the top of the heap of hybrid analog and digital Pro Trek products, this watch has a couple things that make it stand out from the pack. The wearer gets to enjoy the solid feel and lightness of it’s solid titanium band. And as the owner of it he has the confidence that he can wear it without it showing wear and tear since it is ion plated and sports a sapphire crystal. Update: PRW6000YT-1 has not shown up in the usual places for sale. A few Japanese sites list it but are delaying shipment presumably against their own fulfillment. I find it, when presented this way, to be an incredible product – impressively jam-packed with all Casio’s newest tech. 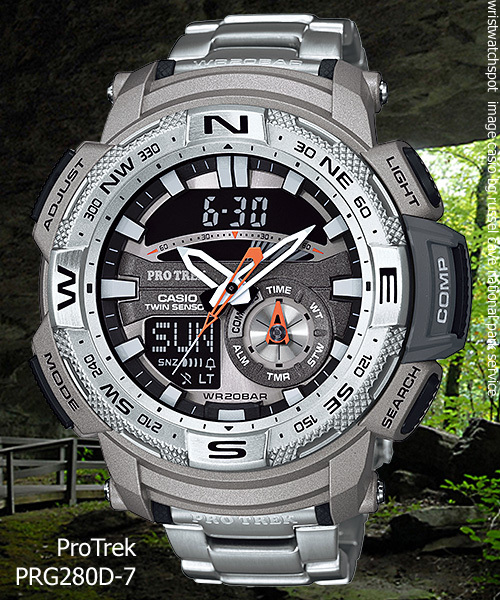 And, before moving on from super high-end ProTrek, whatever happened to this one? So rare, it appears to be extinct. 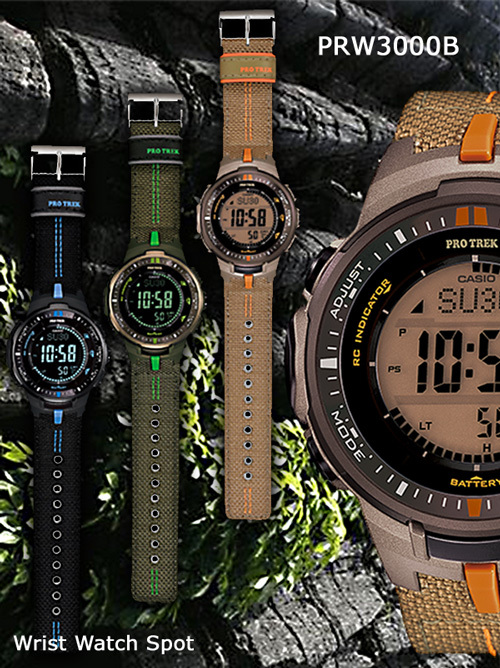 Not only are these watches stuffed with nifty new Casio-original tech, most are quite reasonably priced at only $300 US MSRP. 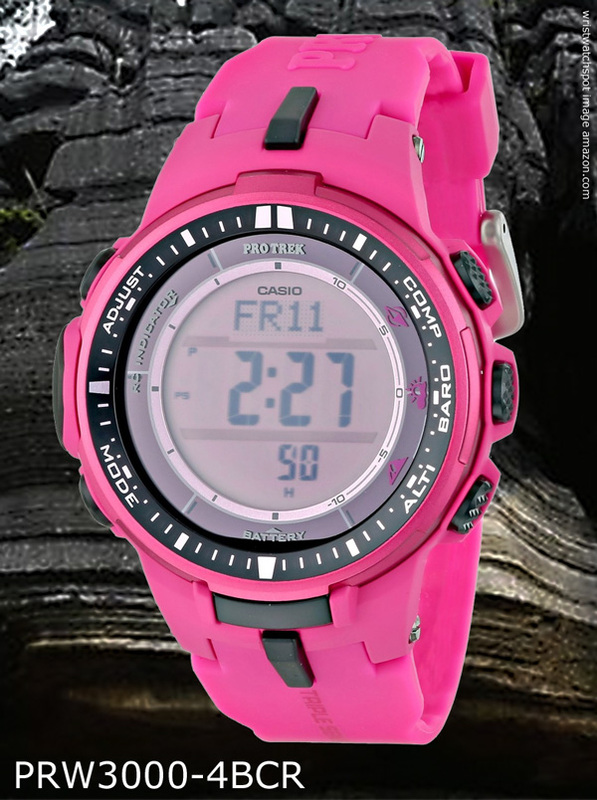 This blog is not an ambassador for Casio, but its hard not to be very impressed with their latest offerings. 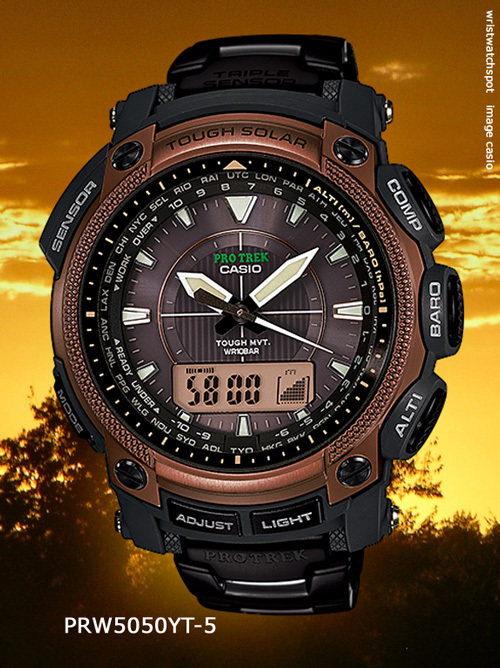 Quoting their online description of this new line of action watches..
“Stay one step ahead of Mother Nature with the Solar Powered PRW3000, incorporating Casio’s new Triple Sensor Version 3 engine. Advanced CASIO original technology has allowed for a 95% smaller direction sensor and 90% reduction in sensor power consumption compared to previous models. Despite their smaller size, the new sensors in this model delivers better accuracy and energy efficiency. This model can measure Altitude in 1m increments (previously 5m) and display compass readings with 60-seconds of continuous measurement (previously 20 seconds). 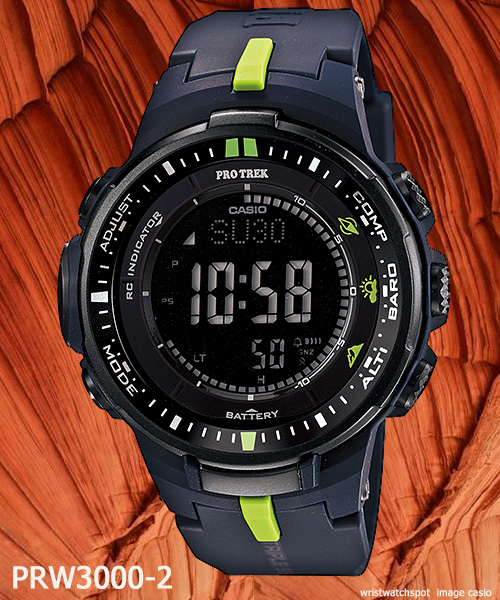 In addition to the altimeter and digital compass, the watch’s Barometer, incorporates a unique Barometric Pressure Tendency Alarm that alerts the wearer to sudden changes in pressure readings. Casio is getting really good at these promotional video clips. Check this one out.. 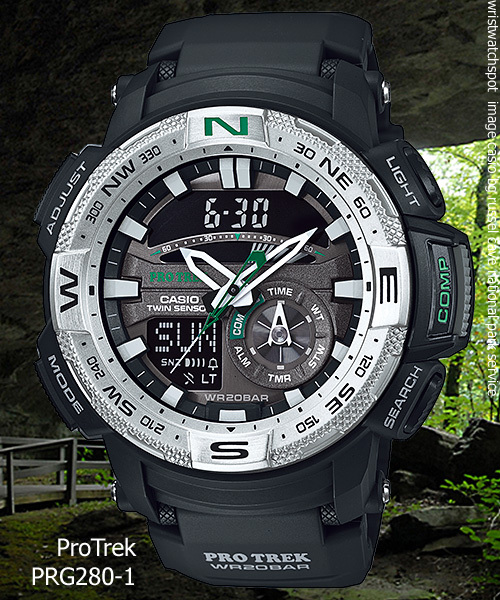 The lines are blurring between G-Shock, ProTrek, and Edifice with respect to the higher-end features and operability. In the case of this new model, like G-Shock, we see the mix of analog and digital subdials, deeper water resistance, stationary compass bezel, and lots of plastic parts that would have been classier in metal. But we get it – trade-offs are made to keep the price down. This new piece is not solar, atomic or tough movement. 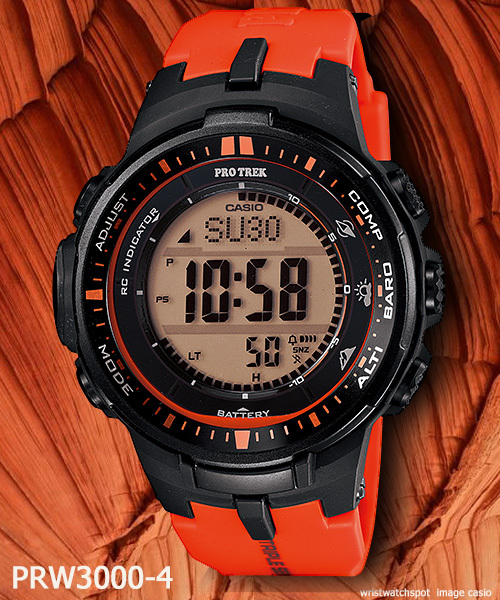 The battery life is the shorter two years (with moderate use of the sensor features) that more and more watches exceed. It has the twin sensor tech; compass and temperature. Other features sound like a list out of the G-Shock catalog – timers, etc. 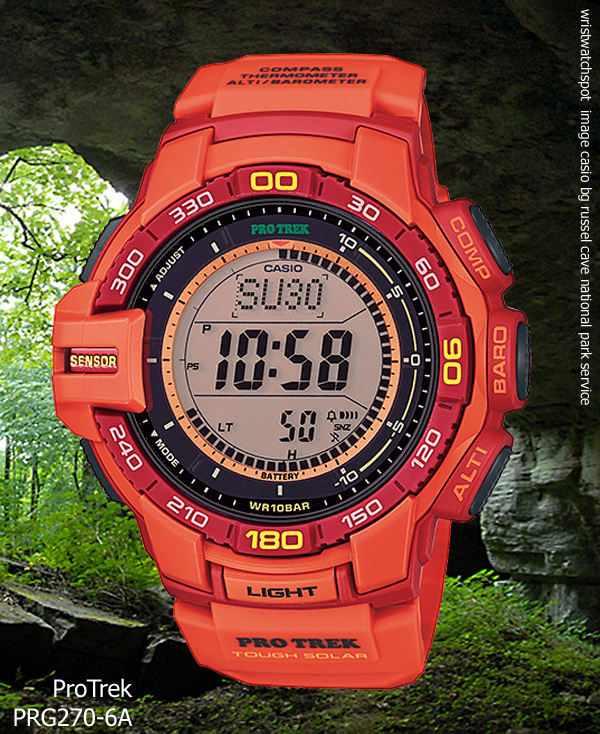 With a super illuminator auto LED that afterglows, the watch will be useful at night and in poor lighting conditions (like in a cave or up a mountain in the fog, you adventurer, you). 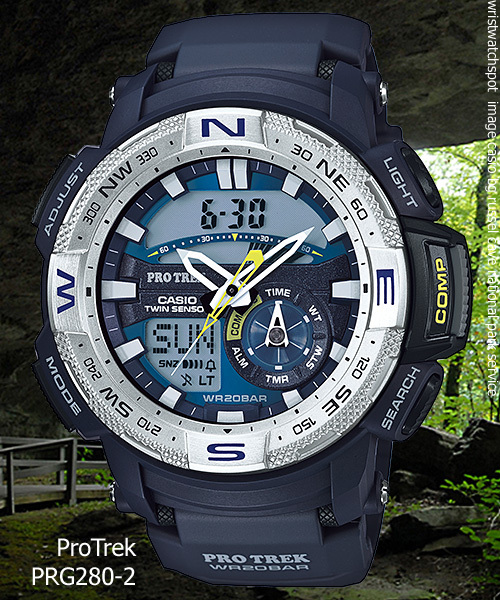 The compass feature is enhanced, having a wide readout of a bearing memory function. Anyone who uses the compass a lot will enjoy the jumbo pushbutton that activates it. It’s almost like it is a compass that is also a watch. 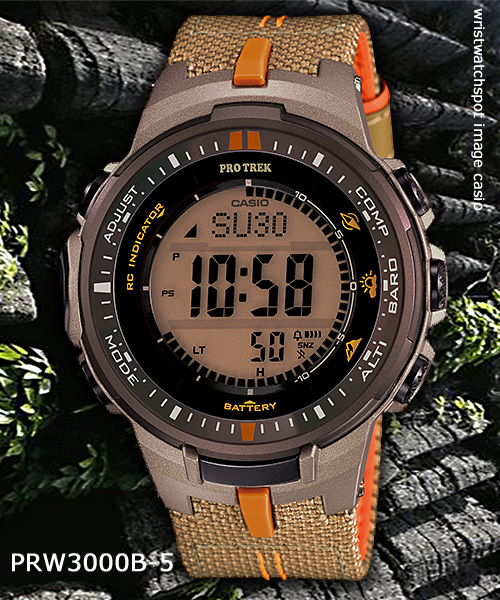 This blogger can see the PRG-280 as the go-to congratulatory gift for all the new Eagle Scouts upon earning their prestigious badge (this is a non-subtle hint to Casio Altruistic). The step up PRG-280D-7 includes a stainless bracelet and is MSRP at 36,000 Yen. 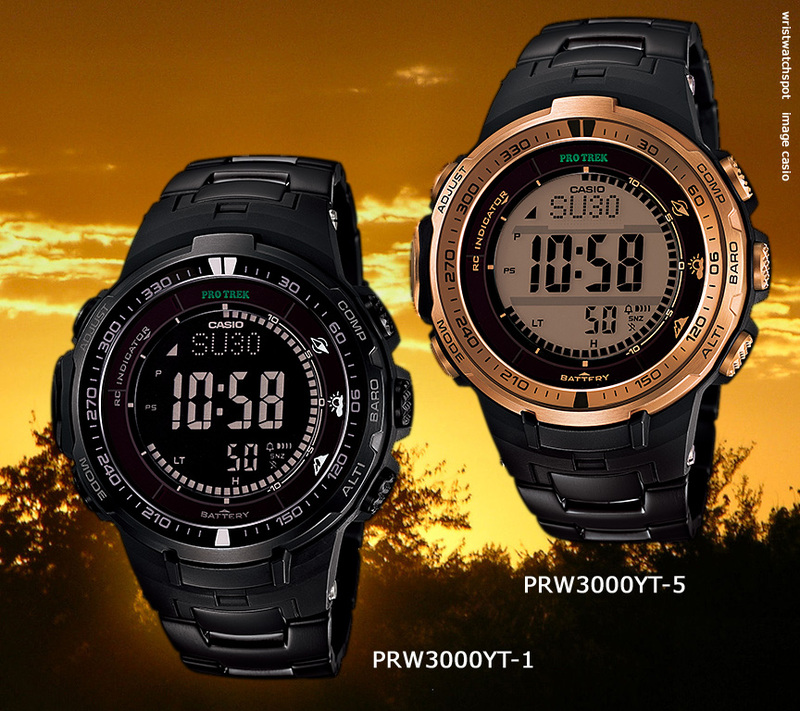 The standard models, PRG-280-1 and PRG-280-2 are priced at 26,000 yen. Availability in Japan; August or September, 2014. 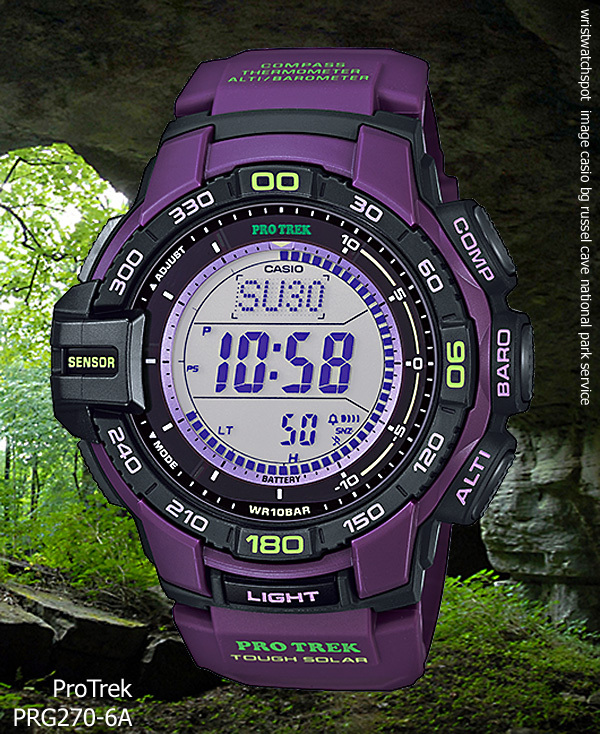 The following images are other ProTrek releases from the last year.. 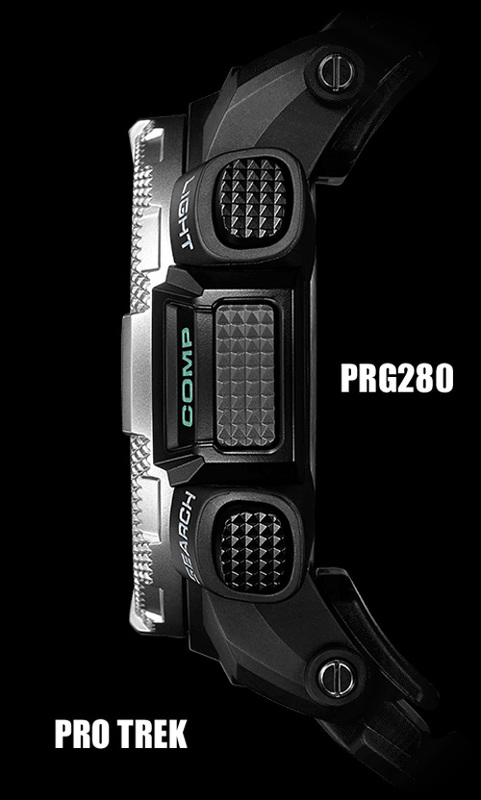 So, you want the sensors and can live without the Atomic feature – well, consider the PRG270 line up at only $180 retail. 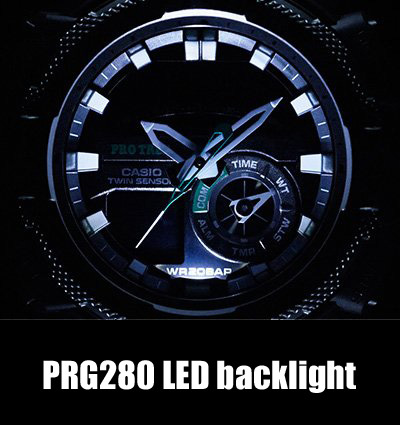 “Solar Powered PRG270 which incorporates Casio’s new Triple Sensor Version 3 engine. Advanced CASIO original technology has allowed for a 95% smaller direction sensor and 90% reduction in sensor power consumption compared to previous models. Despite their smaller size, the new sensors in this model delivers better accuracy and energy efficiency. This model can now Altitude in 1m increments (previously 5m) and display compass readings with 60-seconds of continuous measurement (previously 20 seconds). 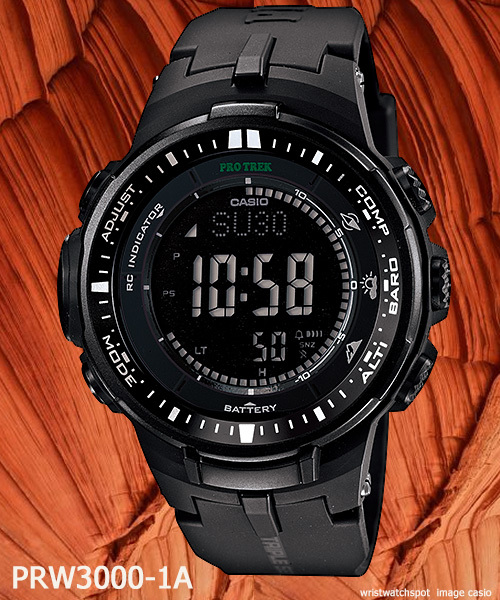 In addition to the altimeter and digital compass, the watch’s Barometer, incorporates a unique Barometric Pressure Tendency Alarm that alerts the wearer to sudden changes in pressure readings. 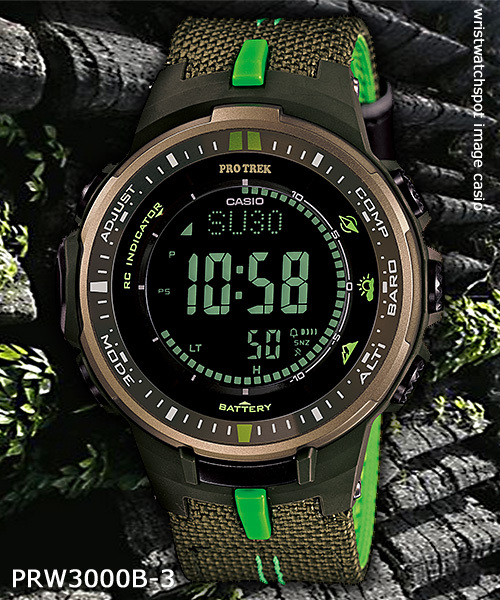 And what ProTrek review would be complete without Casio Japan Official’s sweet little video clip visually showing off the great features of this line. All images belong to their respective owners – this blog claims no ownership or graphic authorship. We clean up the images and enhance the backgrounds a bit – otherwise we just report what we find interesting.